The normal recommendation is for a child to have a dental appointment by the time he/she is one year old, or make an appointment within six months from the time the first tooth is present. What Will Occur During The First Visit? The initial dental visit is normally brief and involves little treatment. The first visit provides the child with time to become familiar with the dentist in an environment that is friendly and non-threatening. At times the dentist may request that a parent sit with a child in the dental chair while the child is being examined. During a portion of the visit it may be requested that the dentist and child spend some time alone so that they can build a trusting relationship. During the first visit all of the existing teeth of the child will be examined for decay, and any potential issues with the bit, jaw, oral tissues, and gums. If needed, existing teeth will be cleaned and an assessment will be made to determine if fluoride is needed. The parents will also be educated regarding the basics of pediatric oral health, dental development will be discussed and question will be answered. Dental checkup schedule – we normally like to schedule visits in six month time intervals, to increase a child’s comfort level, to see how the teeth are developing, and to correct any incipient issues. Child’s health information history. Come with necessary medical information. You will be asked to complete medical and health information forms concerning the child during the first visit. Come prepared with the necessary information. How Does A Pediatric Dentist Differ From A Regular Dentist? Pediatric dentists have two years of training on top of dental school. This two years concentrates on treatment and management of the developing teeth of a child. The training also includes the growth and development of a child, along with child behavior, and the specials needs associated with pediatric dentistry. Even though a regular dentist has the ability to address the needs of a child, a pediatric dentist, staff members and even the décor of the office are all designed to put children at ease. Our pediatric also have the training and experience to care for special needs children. When Should The First Dental X-Ray Occur? There are not any specific guidelines regarding dental x-rays. Children who are at high risk for dental issues (cleft lip, prone to tooth decay from baby bottles) will need x-rays sooner than others. In most instances, an x-ray is taken by the time a child is six years of age. Children start to get adult teeth at 6 years, and x-rays have a vital role is determining if they are developing properly with the jaw. Bite problems can also be identified. Primary teeth have importance for numerous reasons. They help children to chew and speak normally and form a path that is followed by permanent teeth as they erupt. What Should Be Used To Clean A Baby’s Teeth? Use a toothbrush to remove plaque that can give rise to decay. A toothbrush with a small head and soft bristles, that’s designed for infants , will work well. Brush teeth at bedtime and once during the day. Are Pacifiers And Thumb Sucking Problematic? Pacifier and thumb sucking habits will normally become problematic if they are continued for a long time-period. The majority of children discontinue these habits by themselves. However, if this continues beyond three years of age a mouth appliance might be recommended. What If There’s A Toothache? Initially, rinse the affected area with warm brine and put a cold compress upon the area of the jaw that is swollen. Administer acetaminophen for pain. Lastly, make a dental appointment as soon as you can. How To Prevent Decay That Results From Nursing? Don’t nurse children as a way to get them to sleep and don’t use any fluid other than water at bedtime. Learn the correct way to floss and brush the child’s teeth. Bring the child to one of our pediatric dentists so that the teeth and gums are regularly checked. The initial dental visit should be prior to one year of age. What Type Of Diet Is Safe For Teeth? Ensure that the child receives a balanced diet consisting of one serving of dairy products, fish meat and eggs, cereals and bread, and fruits and vegetables. Limit the use of starches and sugar to protect from cavities. Our pediatric dentist can assist you in selecting foods that will help avoid tooth decay. You can use toothpaste right away as you clean an infant’s gums using an infant toothbrush or soft cloth.Use a small smear of fluoride toothpaste while brushing the child’s baby teeth twice a day as soon as they’re present. For children three to six years of age the amount of toothpaste used may be increased. 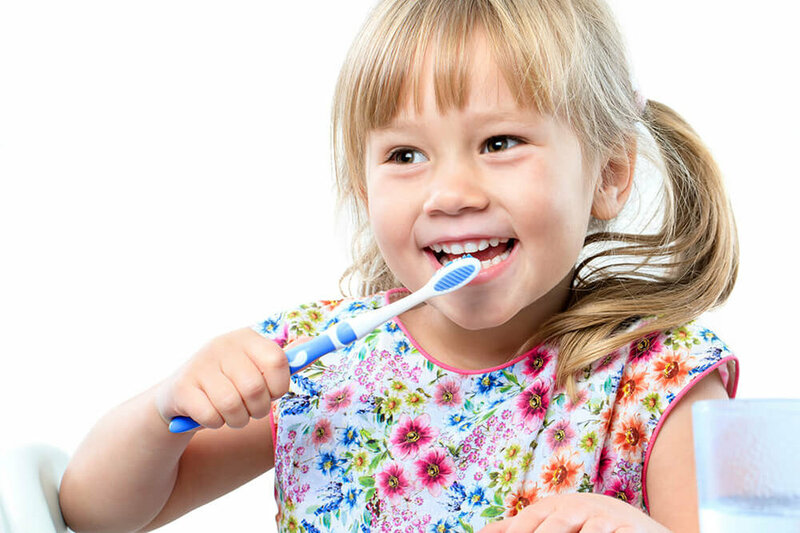 Be aware that young kids aren’t able to effectively brush teeth. The excess toothpaste should be spit out after brushing. Be sure it is not swallowed. The level of fluoride in the child’s drinking water should be evaluated by one of our pediatric dentists. If the child doesn’t receive adequate fluoride, particularly if bottled water is used, then a fluoride supplement may be prescribed. Dental sealants will fill in the nooks and crannies on a tooth’s chewing surface, particularly molars. This prevents particles of food from being trapped in the teeth, which can cause cavities. Dental sealants are quick and easy to apply and offer protection for several years. How Can Teeth Be Protected While Playing Sports? A mouth guard made from soft plastic can be worn during sporting events to protect gums, cheeks, lips, and teeth from injury. We can develop a custom mouth guard for your child to protect him/her from sports injuries. What If A Child’s Permanent Tooth Gets Knocked Out? First, try to stay calm. Next, locate the tooth. Try to hold the tooth by its crown rather than its root and attempt to insert it back into the socket. If you aren’t able to do that, place the tooth within a cup of milk and bring your child and the tooth directly to one of our pediatric dentists. Dental x-rays have an extremely small risk. Our pediatric dentists are very particular about limiting the radiation to which a child is exposed. High speed film and lead aprons are utilized to keep the amount of radiation to a minimum and ensure safety. What Can Parents Do To Prevent Cavities? Parents can make sure that their children have regular dental visits, starting when the first tooth erupts. One of our dentists can then create a program for flossing, brushing, and additional treatments for parents to use while supervising and teaching their child. Home oral care, coupled with periodic dental appointments, and a diet that’s balanced, will be a good start for proper dental care that will last a lifetime.